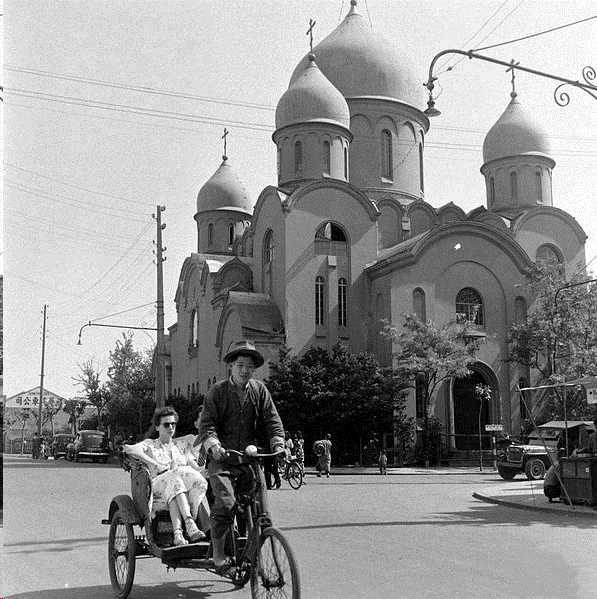 Russian Orthodox Cathedral in Old Shanghai, where I was baptized. SAN FRANCISCO California—(Weekly Hubris)—April 2019—I can’t prove that I was born. There is no birth certificate recording my birth. It was lost somewhere in our escape from China. I can, however, prove that I’m a baptized Orthodox Christian. Since there was no Greek Orthodox Church in Shanghai, where I first drew breath, my family attended St. Nicholas Cathedral in Shanghai. I have two memories of that church. One in which I stood at the offertory dedicated to the remembrance of the dead, where my grandmother lit candles to commemorate the many members of our family who’d passed away. I looked up at the depiction of an almost life-sized Crucifixion hanging over the small altar replete with lit white candles, pointed up to the image of the bleeding Christ, and weeping, shouted, “Booboo!” expecting my grandmother to make it all better. I was three. The other memory was the feast of Christ’s baptism in the Jordan. A cross made of ice stood in the courtyard of the church where the service was held, violets resting on the arms of the cross. I can still see the wintry sun gleaming on the ice, the lush purple of the violets, and smell their scent. It was January 6, and Mao’s invasion of Shanghai was as remote a possibility as our leaving China. The memories of that invasion and our consequent escape are also all too clear, but hardly as welcome as the former. I was four when we made that perilous journey, when death was a daily threat, when a pain I couldn’t define seized me at leaving our wonderful dog, Ginger, with a kind Russian gentleman who’d later inform us that Ginger had lived a long and peaceful life. Sometime afterwards, I learned that that pain was called heartbreak; that the memories of the cathedral were assigned to something called nostalgia. But what I never could explain was how it was possible for me to remember things that happened to me at such an early age. My mother questioned me on that fact and, to prove my point, I told her precisely where I went when I took my first steps. The images of all those recollections, brightly lit and rendered in true, clear colors, scents and sounds as real as yesterday’s walk through the park, will never leave me. An American freighter called The Flying Arrow transported us from the five-mile limit outside the Tientsin harbor to Yokohama, Japan. Our night-time journey in a Chinese tug boat from the harbor to the ship on a storm-tossed sea is another incident I remember in great detail. Having lived through bombings, terror was no longer new to me by then, but despite its familiarity, it hadn’t lost its power. I screamed when my father handed me to a crew member who was standing on the suspended ladder of the ship. In the gap between that ladder and the edge of the tugboat was nothing but blackness and the occasional hiss of a roiling sea. My mother followed the sailor, who was rushing up the swaying ladder. Even when we’d finally reached the deck and I was handed to my mother, I couldn’t stop sobbing. My first encounter on that ship was with a kindly black gentleman who happened to be the cook. He escorted my mother and me to the dining room, and brought me a dish of strawberry ice cream to calm my hysterical sobs. I’d never tasted ice cream like that before—nothing quite as rich and smooth. Needless to say, my sobs were replaced by serious attention to that beautiful pink delight in a white porcelain bowl. Sadly, I don’t recall the name of that kindhearted cook, nor the names of all the other crew members, including the captain, who made it their business to keep me entertained during our voyage to Japan. My recollections of Japan are many, rich with the history and customs of that land, and with the people there who have impacted my life. Again, each person, each incident, is clearly etched into my memory. And in all this immersion in Asian cultures, my family’s devotion to our Greek heritage persisted. Their adherence to our Orthodox faith, its rituals, feast days, fasts, and observances defined every month of our five years in Yokohama. Again, in the absence of a Greek Orthodox Church, we attended Holy Resurrection Russian Orthodox Church, or Nikorai-do, in Tokyo. My parents spoke Russian, and they taught me the language. At the St. Maur’s Convent School in Yokohama, the only European school in the area, I learned French and English, was steeped in the literature, art, music, and history of both England and France. And, of course, I learned about Catholicism, which, in my child’s mind, I juggled with Orthodoxy and Buddhism. 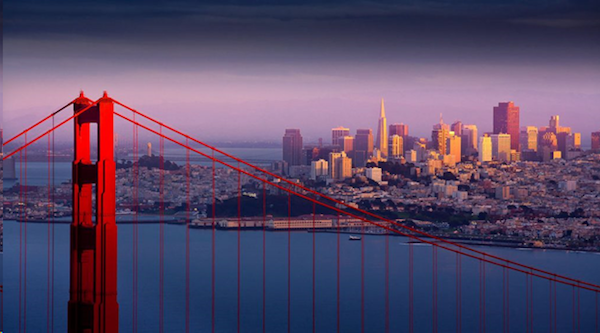 San Francisco, the “City by the Bay,” where refugee communities thrive. In 1954, we came to the United States. The adjustment was eased by the fact that my aunt had lived here for a while. 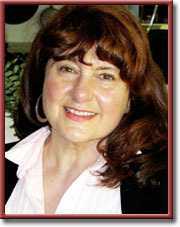 She worked at Stanford University, as the Slavic Language Librarian at the Hoover Institution. We adapted to American culture but never forgot our roots, never gave up our religion, the ethos of our faith. My first foray into Greece happened in 1979, when I joined a University of California, Berkeley, tour of classical Greece. How strange it was to hear Greek spoken everywhere, and how wonderful. I felt as if I’d come home. But, to be quite honest, not every Greek I met thought I belonged. It led me to wonder where my home really was. Greek, Japanese, Russian, French, and British cultures are all familiar to me. I adapt quickly when in a foreign country, reach into my memories to speak the appropriate language, behave in the accepted manner. But I am always a foreigner, a little detached. Now that April is here, the month of my birth, the month when we celebrate Easter, I wonder about my life’s journey, wonder where I might call home. I am comfortable in San Francisco, the city in which I now reside, perhaps because it’s a city of refugees, of immigrants who’ve managed to assimilate while still maintaining their unique cultures. But in watching the politics in our country, the divisions which are fueled by so much vitriol, I’m uneasy, unsure of my belonging. My friend Despina Meimaroglou reminds me that we are citizens of the world. She’s right. I’m lucky to be occupying a small corner of it where my color, my faith, my age, don’t count against me. Helen, this is beautiful. Please sit down and plug away at your full memoir. These tastes promise a really good read!